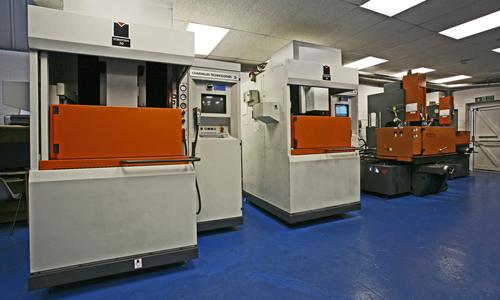 The ability to meet customers time critical requirements depend totally on having sufficient staffing and machine capacity to handle the workload. Electro-Discharge operate a double shift pattern that covers an 18 hour day, this combined with a 'lights out' capacity provides 24hr a day production capabilities. Total production capacity for the 3 Electro-Discharge sites runs at up to 5,700 hours a week. 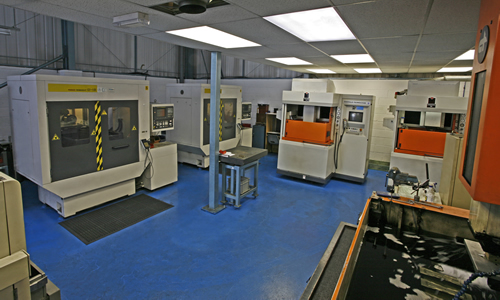 Supported by a dedicated design team and in house tooling facilities, Electro-Discharge are positioned to provide one of the most expedient and cost effective EDM services in the UK. In a time critical business Electro-Discharge's IT functions provide real time notification of customer communications, and provide the ability to respond 24/7. 2x ASTEK HIGH SPEED DRILLING UNITS CNC HOLE PATTERNS AND POSITIONING. ADAPTABLE TO TURRET MILL.